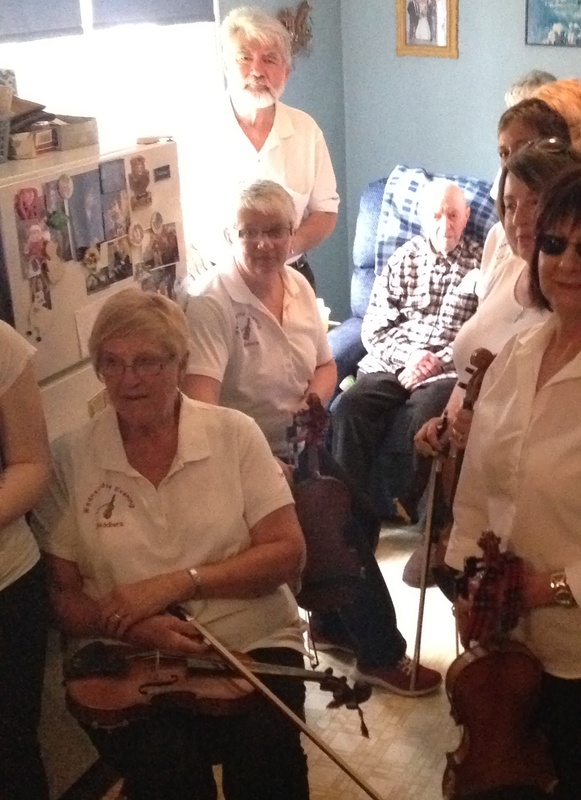 The Fiddlers visit Joe in May of 2015. Today is a rather special day, Joe Farquhar, one of the founders of the Wednesday Evening Fiddlers turns 96 today [22 Sept. 2015]. Joe played with the group for many years and through his family, grand children and friends, supplied us with many new fiddlers. Joe also made and repaired fiddles for the group. Joe is also a bit of a historian and has written a number of accounts of life and times around Victoria County NB. In 2001 he wrote some memories of the fiddlers, included below. It is interesting to go back and read this from time to time. We wish Joe a very Happy Birthday. In April 2001, Joseph Farquhar was asked to write down his memories of the beginnings of the Wednesday Evening Fiddlers. The following notes were prepared by Joe. The group was not named until 1988, the first suggested name was the Victoria County Fiddlers, however some of the members did not like the idea so Shirley Gamblin suggested the Wednesday Evening Fiddlers and that stuck. The Wednesday Evening Fiddlers – by Joseph Farquhar. The following is a brief history of how the fiddle band got started in a small NB town and covers a time period from 1986-87 to date. To name people involved is fairly easy, when something took place is a little harder. This is not to relate the many little side effects of a personal nature; also if there are any errors I would be glad to see them corrected. During the Fall & Winter season of 1986-87, it happened that 4 people, Cameron Bishop, his wife Dawn, Ed Love and Murray Grant began meeting at the music room at SVHS (Southern Victoria High School). They used the room on Wednesday evenings to have jam sessions from 7 to 9 PM. Cameron played banjo and fiddle. Dawn, a good piano player also read music, Ed Love and Murray Grant played guitars. Only a few meetings were held that winter, they invited guests who were well known musicians like Freddy Rattray or Paul Smithkey. These sessions ended in the Spring, I was not aware that this was happening. On Oct 16-87, I got a call from Cameron inviting me to come to the first meeting to be held on Oct 21-87. Those at this meeting were Cameron & Dawn Bishop, Ford Watson (guitar), Ed Love, Murray Grant, Amos Kelly (fiddle), and myself. March 2 – Fred Rattray (fiddle), this was a very special night because we were made acquainted with Garold Hanscom, who appeared to be a guitar player, who also had a fiddle that didn’t appear to have been used very much. Using the music room had some good features and some poor ones. The location was central with no cost, someone had to be trusted with a key, we had to leave at 9 PM sharp and it was closed in the Spring. To keep going we met sometimes at members homes. Some more joined including old time fiddler Clifford Lockhart. A tourist information center had just been built in Andover, and with the help of Maurice & Shirley Gamblin, we started using it. A few dollars were donated to plow the road in Winter, in Summer the sun shone in like a blast furnace. It was unheated in Winter, the water froze and it was only getting bearable by the time we were ready to leave. Membership grew at this time as did the fans. The building was crowded, someone complained to the bureau and we were ousted. We got lucky, the Knights of Columbus had just built a new hall, we were invited to use it and moved in to play there on August 26 1992. For special events we rented the upstairs, regular jam sessions were held downstairs. The room was excellent, large, heated and toilets with smaller rooms we could use if needed. Membership grew and so did the fans, voluntary offerings were received to pay the janitor, help buy vests, musical instruments, support for students, travel etc. From the beginning we formed a circle around the lead fiddler, keyboard and bass guitar. In turn everyone was invited to lead or at least choose the tune they wanted played. Garold was recognized as the leader, he received bookings and gave us a list of upcoming events which we had a choice of attending or not. If Garold was busy someone else led. Lawrence LaFrance did a lot of this as he had a huge number of tunes in his head and was seldom stuck. The tunes were mostly traditional, very danceable, easy to listen to and usually followed the Down East style of Don Messer. Members and guests played a variety of instruments beside those mentioned, but the fiddle was always the lead. Others included guitars, accordions, harmonica, mandolin, sittar, stand up bass, Irish drum, clarinet, spoons, tin whistle, and banjo. Fans could dance if they wished, we also had singers and step dancers. An effort was made to make newcomers feel welcome, they included preschool youngsters to seniors over 80. We attracted quite a few people from Maine. Since we usually played for thanks, a lunch or donations, the requests to play grew till sometimes it was hard to fit all of them in. Events played for included dances, weddings, funerals, benefits, parades, party’s etc. Since some of us didn’t want to be in a for hire position, we usually played for thanks and or donations. While we were not always used the best, most would agree we were generally treated very well. As for trouble spots we had a few and I think anyone who tried to operate a band will tell you it is not all sunshine and roses. After three or four years of using the K of C hall for a headquarters we had some worries. We had some natural losses from death, illness or young members moving after High School, then there were some who were good musicians but found it difficult to play with a group. Some conflicts of interest occurred and a few splinter groups left. About this time our leader, who had a lot of experience in (man management) did a very wise thing, in fact saved us from extinction. He started teaching a class, it was made up of those very young to those middle aged. This took up about half the evening after which he and any who wished to, joined the jam session. Garold also spent many hours at home arranging music and making learning tapes. The results of this venture are simply amazing, we now have a number of young people who are excellent fiddlers and there are more on the way. While some learned to read music, most of it is memorized so while doing a job, no sheet music is used. None of the original members are attending now and to go back about 10 years when we were using the tourist bureau, I think those still involved are Robert LaFrance, Lawrence LaFrance, Garold Hanscom, Murray & Minnie Paris, and to some extent myself. Perhaps we should make mention of traditional square dancing. Shortly after the Second World War, square dancing became only a memory, so in February of 1997 and after playing some part in reviving fiddle music, Wavel Demerchant, Garold Hanscom and I decided to see if we could do something for dancing. We rented the the Tobique River Centre for an evening, spread the word and tried to do a few old favorites like “Lady of the Lake” with something of a red face that the first attempt was pretty awkward. We were lucky in obtaining a copy of the book “Old Time Dances of NB” written in 1939 and obtained in part from this area. One can forget a lot in fifty years and those under 50 had never heard of this stuff. Since I didn’t feel well enough to dance, but wanted to help, at our second dance Garold gave me a mic and I started calling. We had some good times, the music was excellent, the square dances were spaced with lots of polka’s, two-steps waltz’s, glides, step dancing and singing. The charge was voluntary and the members supplied a small lunch. In summary it is obvious this area is loaded with natural talent, our strength is in the young people, fiddling is alive and well, I’m thankful that the future looks good. This entry was posted in History, News by Bill Duncan. Bookmark the permalink.